4th of July is Coming Soon. . . Celebrate by Making this Fun Independence Day Project! 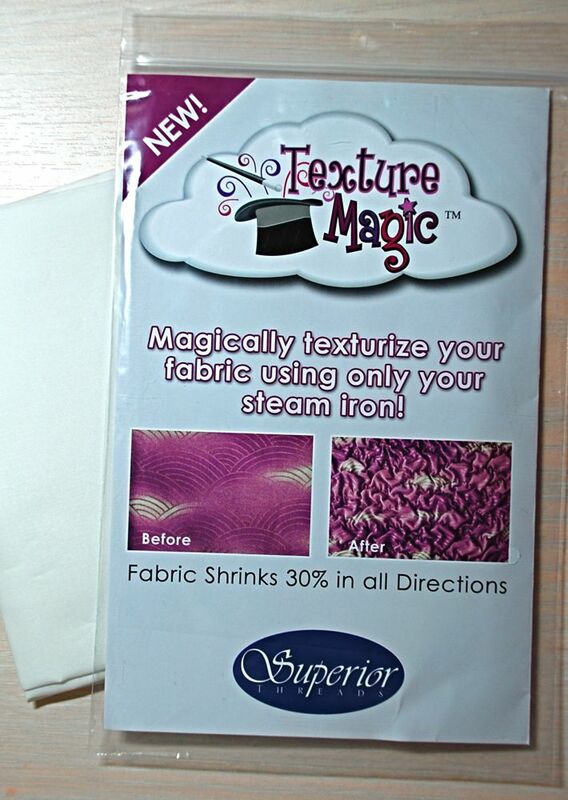 Along with this project I’m introducing a new product called Texture Magic by Superior Threads. It’s an amazing product and it’ll add a new dimension to any of your other projects. 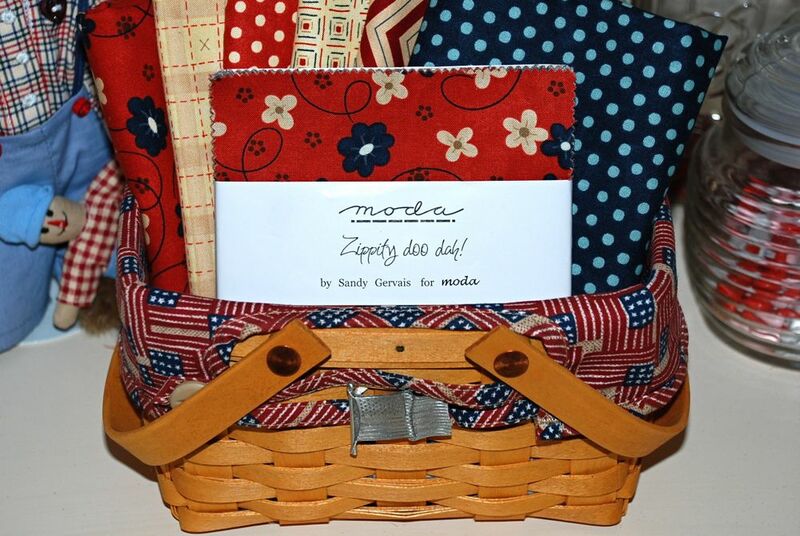 It was introduced at the 2009 Spring Market and is starting to show up in local quilt shops. (except for the red zig zag stars which I was going to use for the binding). Note: I’ve broken the above ingredients down into parts for each of the four steps listed below. Step One: Making the Texture Magic Border Pieces. 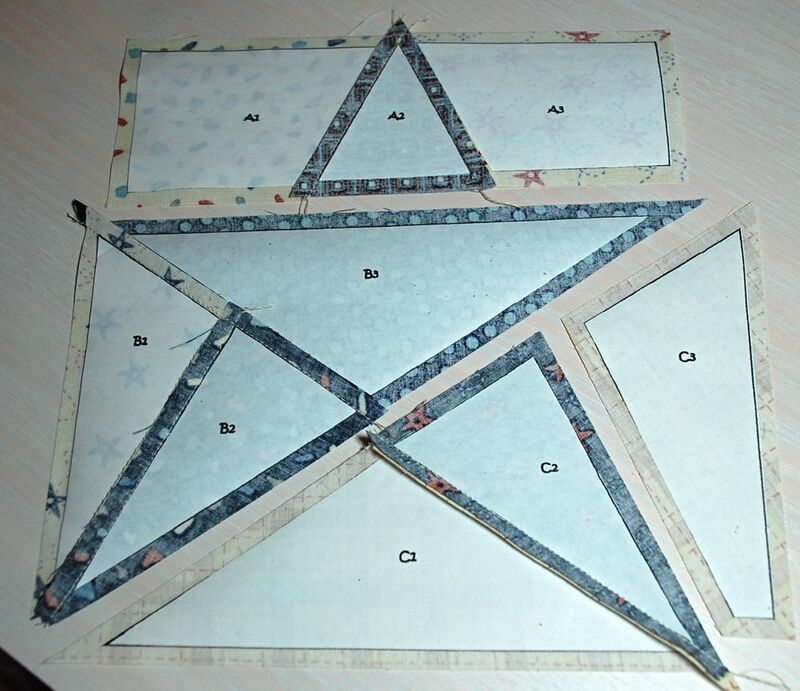 Cut the two 1/4 yard cream colored fabrics in half along the fold (it will measure 9″ x 18″) and set aside the other two pieces for the star backgrounds. You will use one of each of the cream fabrics you cut. Take the two pieces of Texture Magic and use a fine line permanent pen to draw a 1″ grid going back and forth at a 45 degree angle. Pin one piece of the Texture Magic to the wrong side of each piece of fabric and sew along the drawn lines as seen in the picture below. 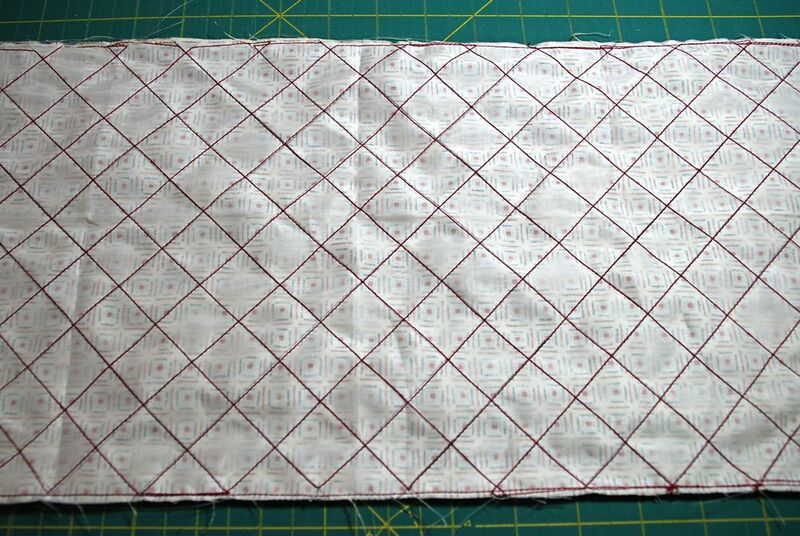 Here’s a picture of what the grid will look like when you are done sewing. Here’s a view of the front and back of the sewn grid. 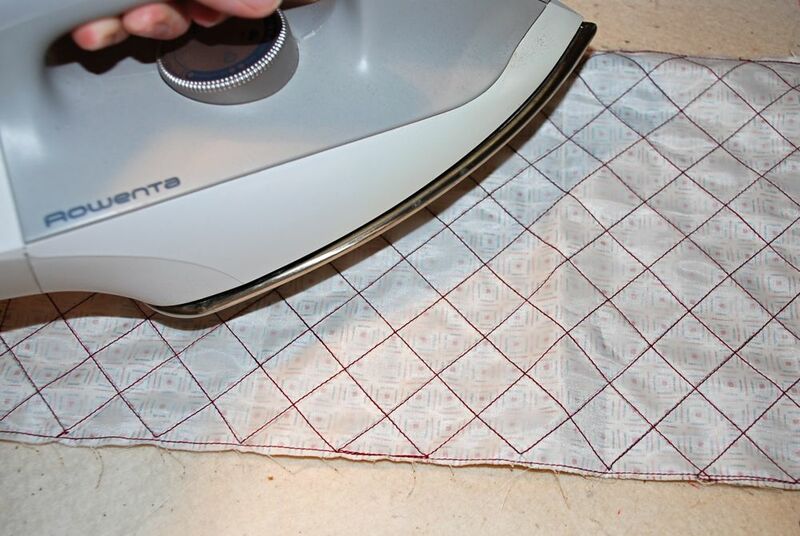 This is Important: DO NOT PUT YOUR IRON on the Texture Magic. Also make sure to read through and follow the instructions on the package of Texture Magic before you begin. Now you’re ready to apply some steam. You will notice in about 10-20 seconds that the texture magic will begin to shrink. You will know it’s done shrinking when it lays pretty flat. I found it kinda works on the same principle as making Shrinky Dinks, it curls up and then flattens when it’s done. 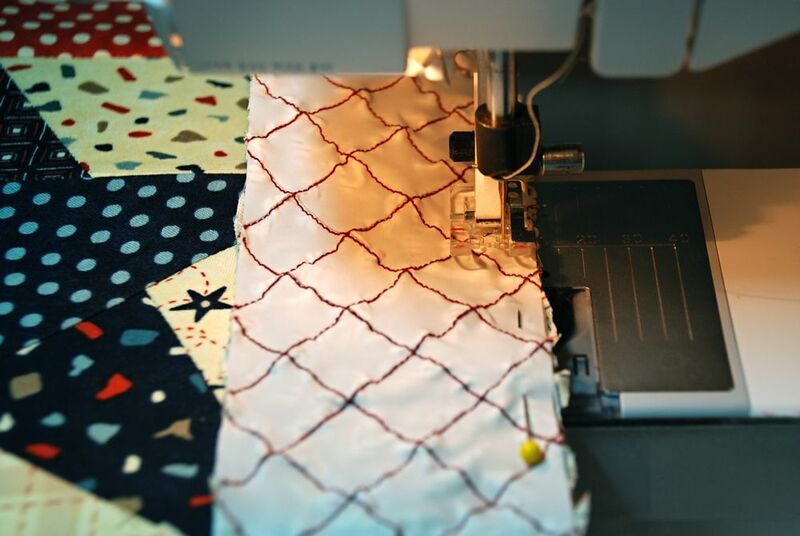 Your sewn 9″ x 18″ fabric pieces will shrink down to approximately 6″ x 14″ which will be enough to cut the strips you’ll need for the four outer border pieces. Set them aside to trim later. 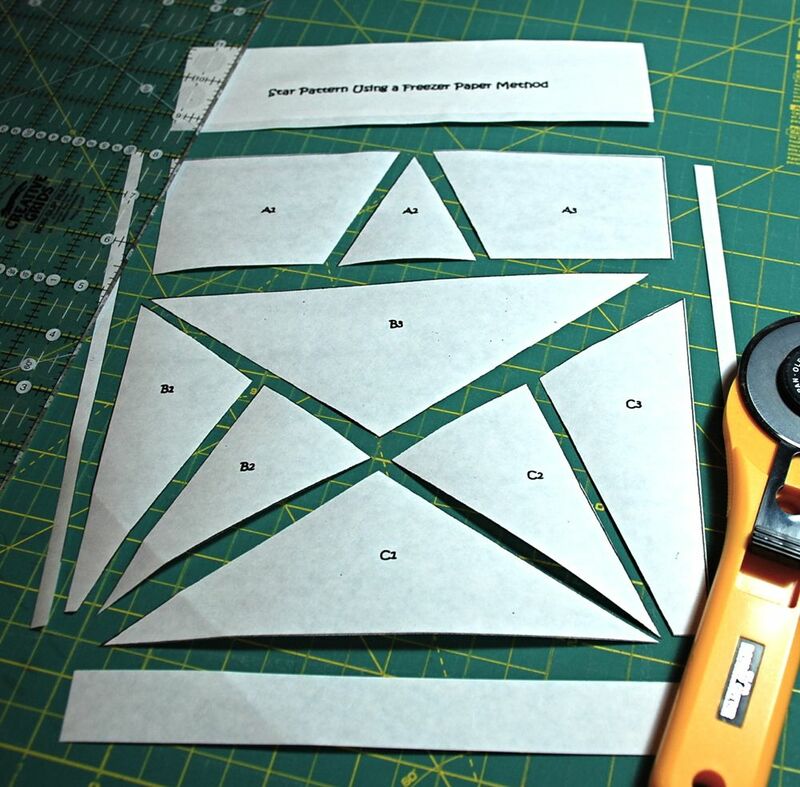 The four border pieces should measure 2 1/2″ x 10 1/2″ after being cut. Step Two: Making the Center Star Block. 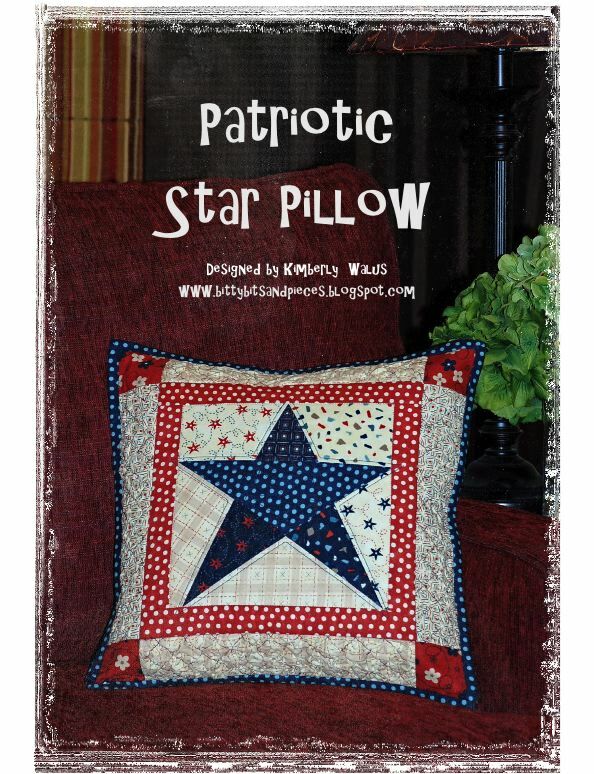 Here is the link to print the 8″ x 8″ Patriotic Star Pattern. Iron the 8 1/2″ x 2″ piece of freezer paper shiny side to shiny side. This will be the edge you feed through your printer or copy machine. 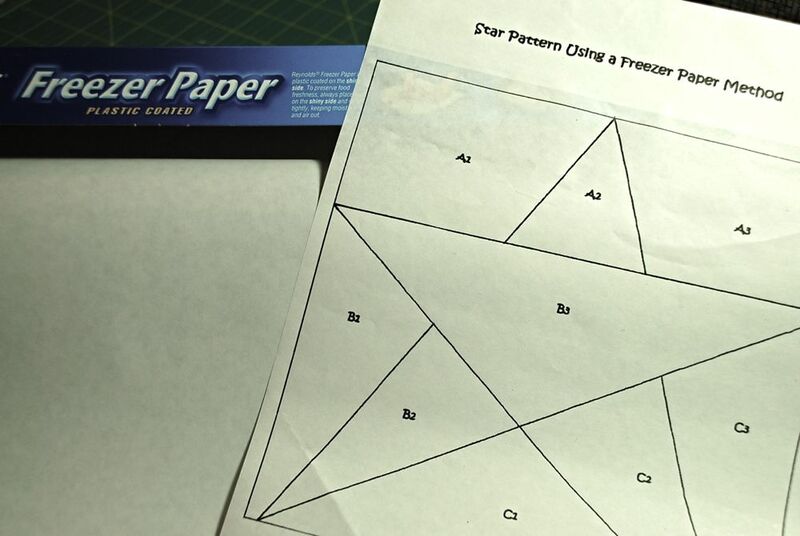 Print the star pattern onto the paper side of the freezer paper. 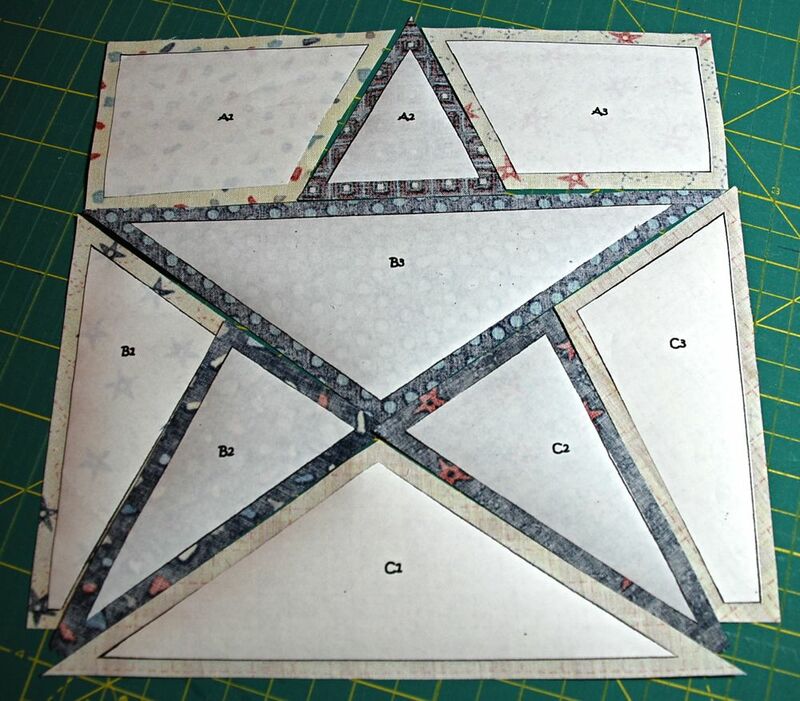 This is the FINISHED size of the star and should measure 8″ x 8″. 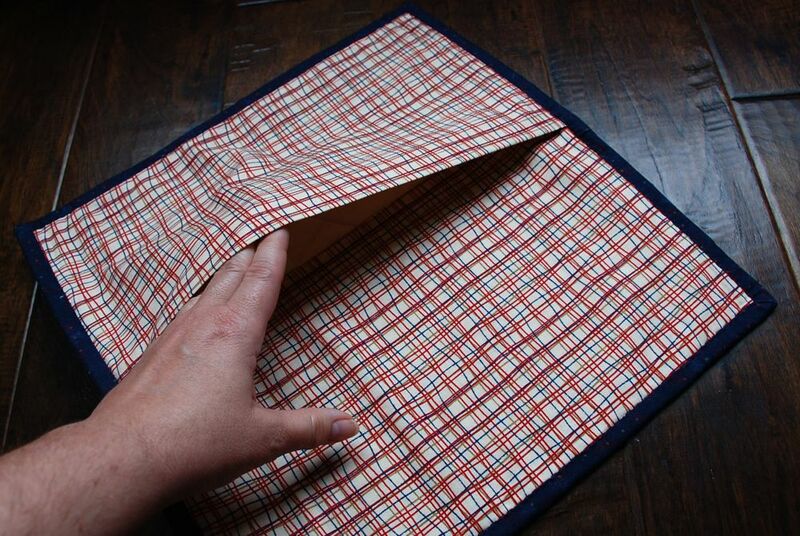 Trim the excess paper around the 8″ x 8″ square. Cut through the 2 (nearly) horizontal lines as seen in the picture below. 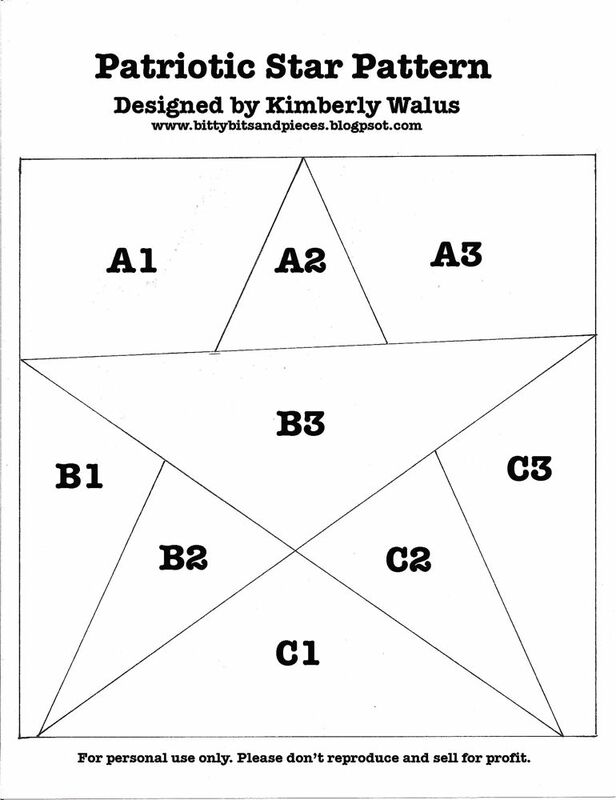 Cut through the lines in sections A, B, & C separating the pieces of the star as seen in the picture below. 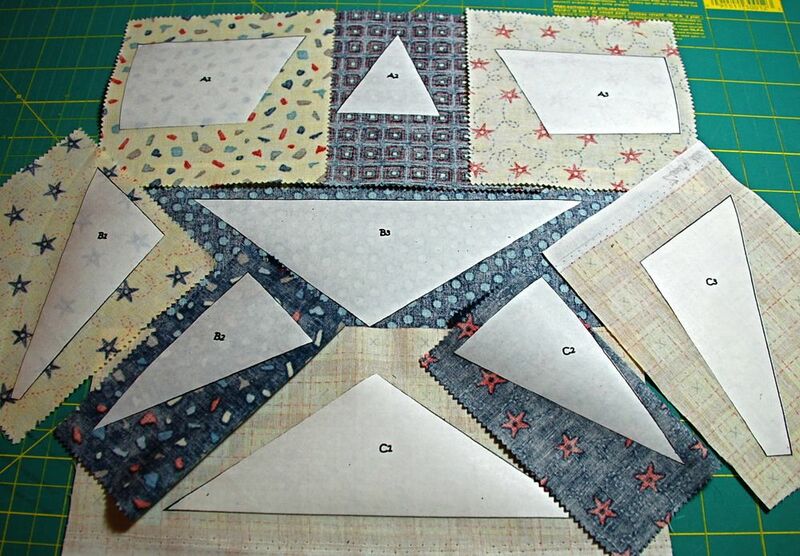 Now you will be ironing the freezer paper star pieces to the different fabrics as listed below. 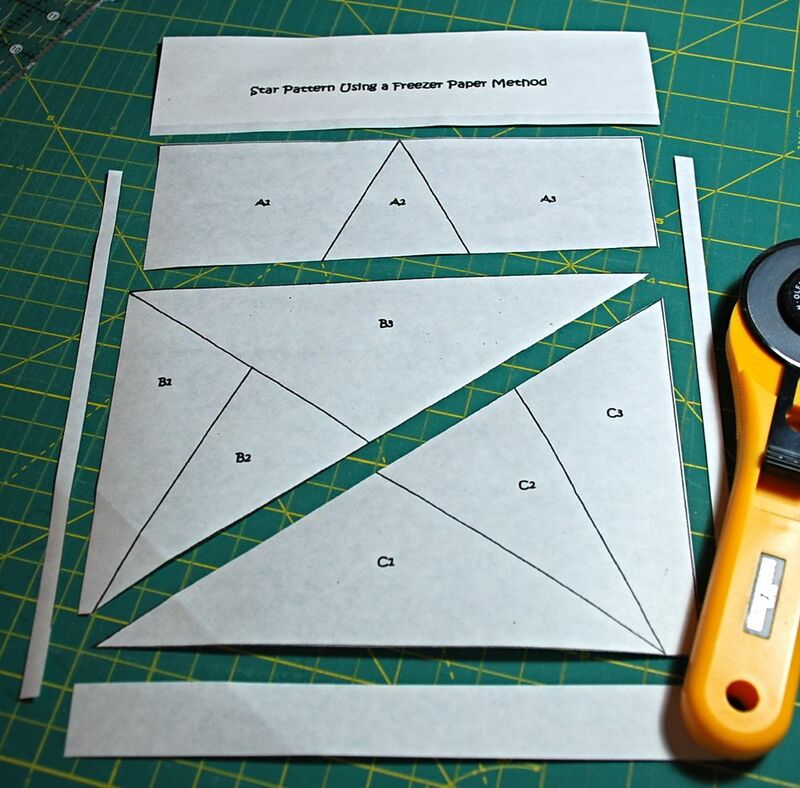 Make sure to allow for a 1/4″ of fabric around all sides of each freezer paper star piece. You need to use the two leftover cream fabric for sections C1, and C3 because they are bigger than the charm squares. The picture below is how the pieces should look before you cut them out. 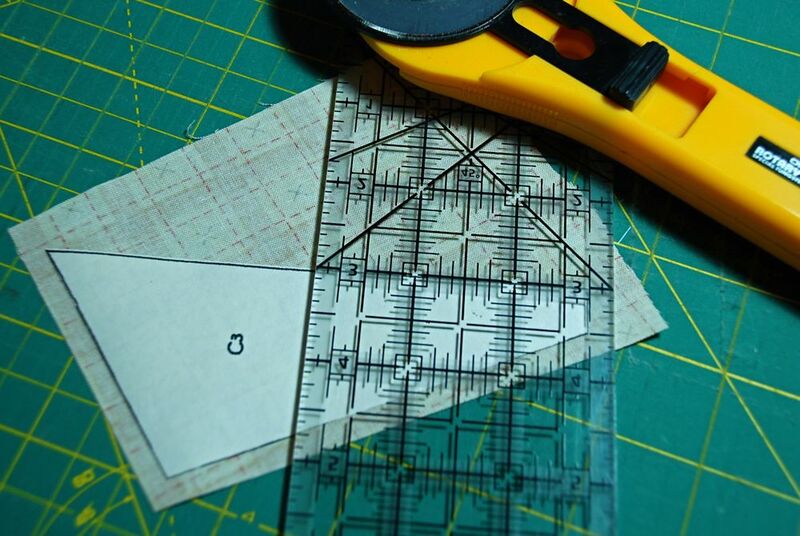 Important Note: Lay your ruler a 1/4″ beyond each side of each piece and then trim the excess fabric. This is what your star pieces will look like after you trim off the the excess fabric. 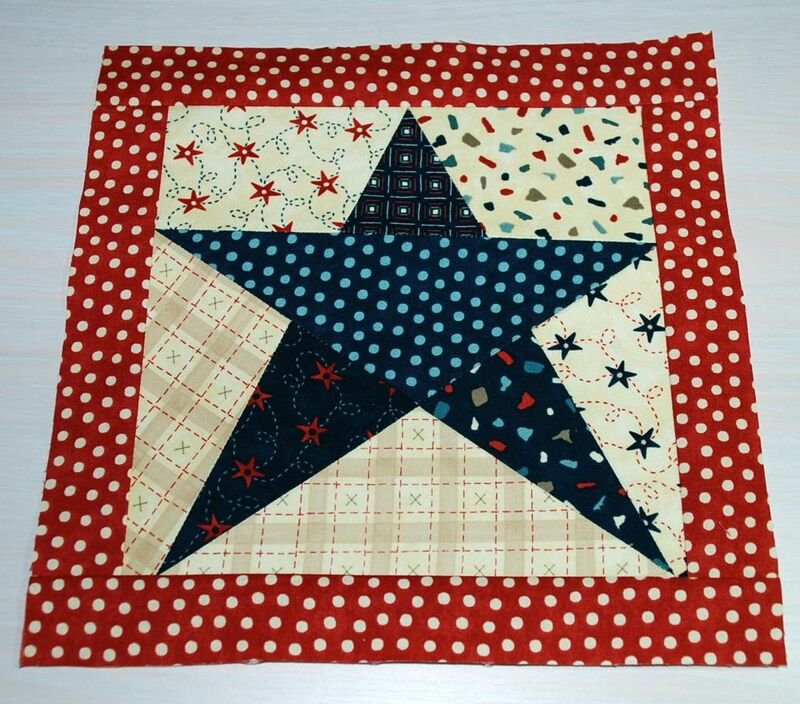 Now we are going to sew the pieces together to make the star center. Take pieces A1 and A2 with wrong sides facing each other and using a straight pin you will push the point of the pin through at the tip or point of A1 through to the tip or point of A2. Then keeping the pin vertical push the two fabrics together. 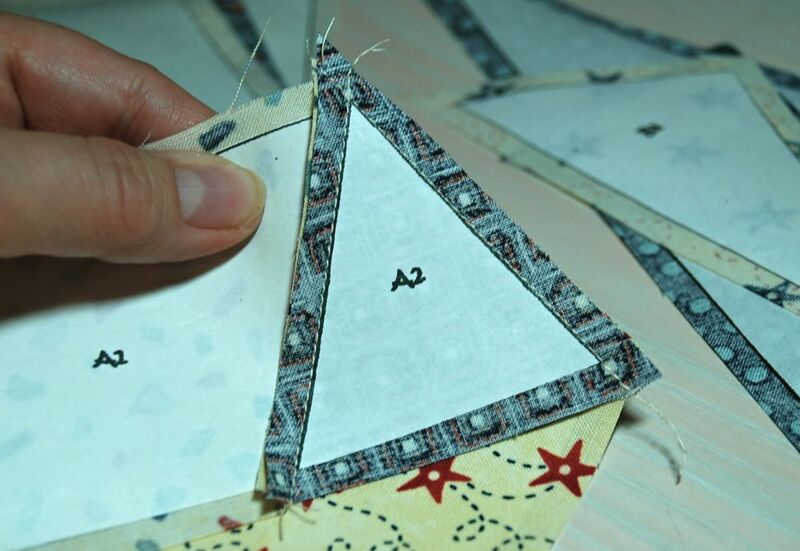 You will now sew along the paper line which is a 1/4″ seam. Press toward the lighter fabric. 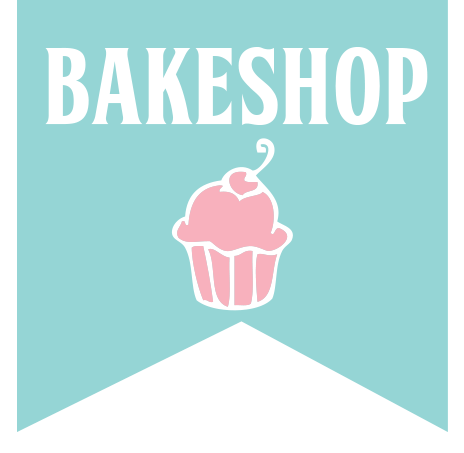 Please refer to the picture below for a visual of the pin placement. Pin and align A2 and A3. 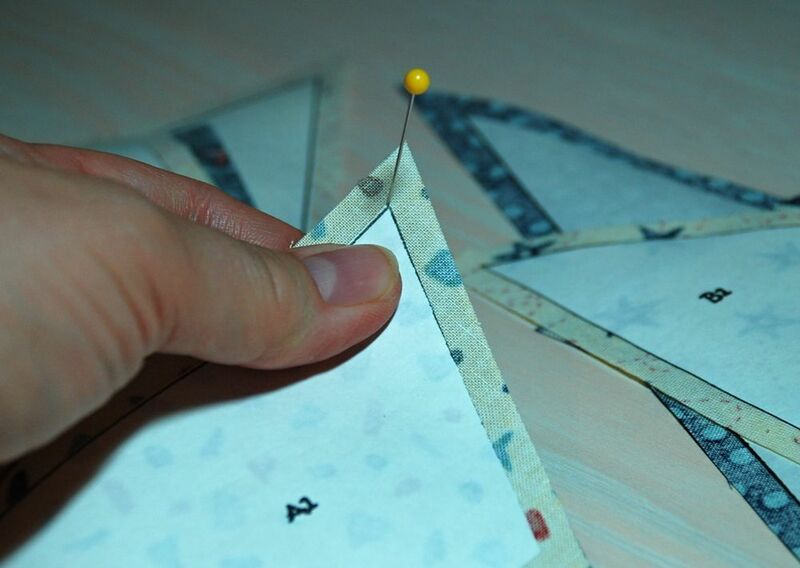 Sew the seam along the paper edge. Press seam toward the lighter fabric. 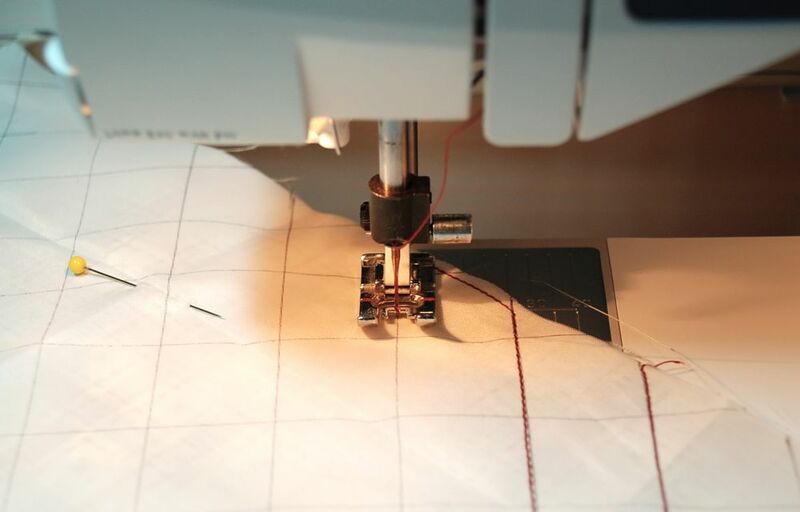 Repeat the process for Sections B and C.
Sew each section together in order from 1 to 3 for all 3 rows. Example: Sew Section A1 to A2 and then sew on A3 to the right side of A2. Here I am pinning the C1/C2 pieces to C3. Here I am sewing the C3 piece to the C1/C2 pieces. Once you’re done sewing the pieces in sections A, B, and C then you are ready to sew the rows together. Match the paper points and corners with a pin and sew the completed Row A to Row B and then add Row C.
Step Three: Putting the Pillow Top Together. 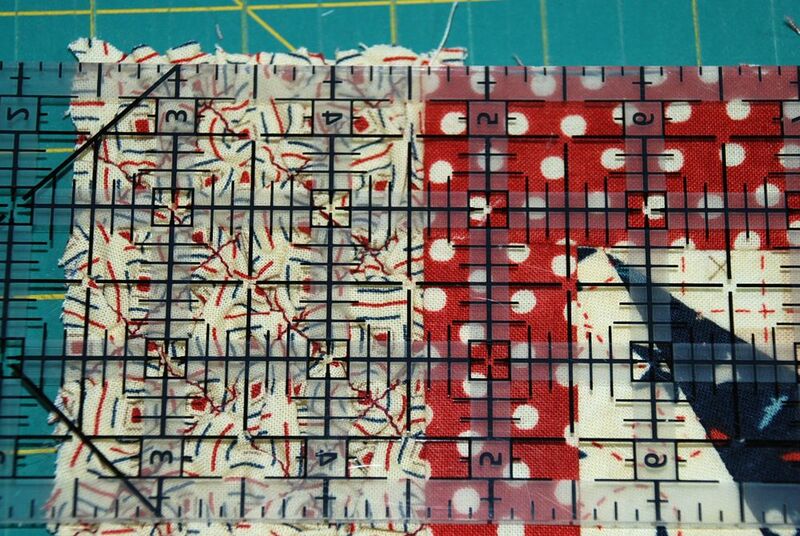 Cut two strips measuring 1 1/2″ x 8 1/2″ from the red polka dot fabric (stop border). 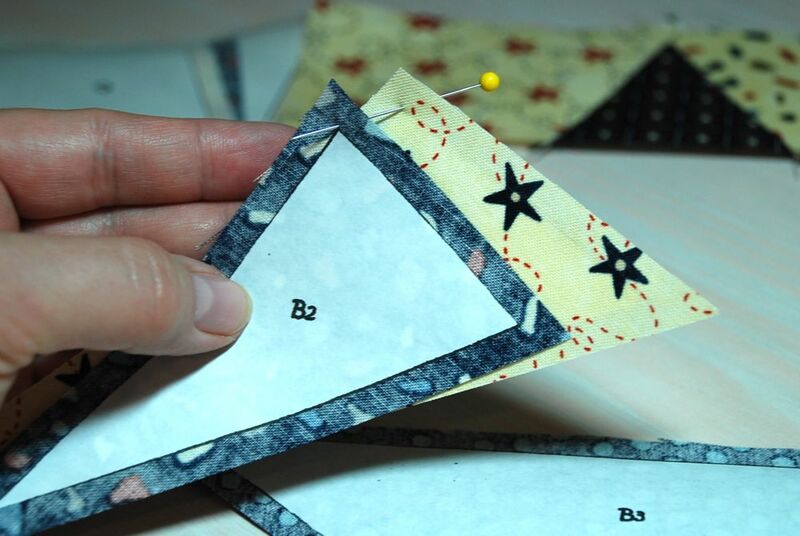 Cut two strips measuring 1 1/2″ x 10 1/2″ from the red polka dot fabric (stop border). Cut four 2 1/2 x 2 1/2″ squares of red floral fabric (corner posts). Cut four 2 1/2″ x 8 1/2″ from the two textured fabric pieces that you’ve made previously (outer borders). 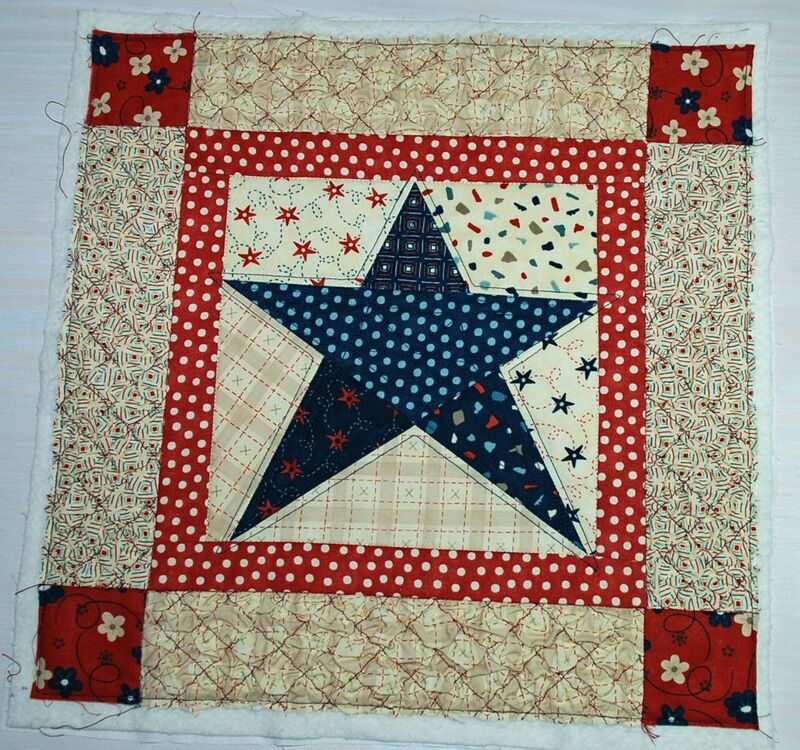 Using a 1/4″ seam sew two strips measuring 2 1/2″ x 8 1/2″ to the two sides of the star center and then sew two strips that measure 2 1/2″ x 10 1/2″ to the top and bottom of the star center. Press seams away from center. See picture below. Square up the pillow center to 10 1/2″ x 10 1/2″. Using a 1/4″ seam sew on two of the 2 1/2″ x 10 1/2″ textured pieces to the sides of pillow. Press seams toward the center. Align your ruler and trim off any excess. Take the red floral 2 1/2″ x 2 1/2″ squares and sew one square on each side of the two remaining 2 1/2″ x 10 1/2″ textured border pieces. Press seams toward the red squares. Then sew each of the rows to the top and bottom of the pillow as seen in the picture below. Press seams outward. Step Four: Finishing it up! 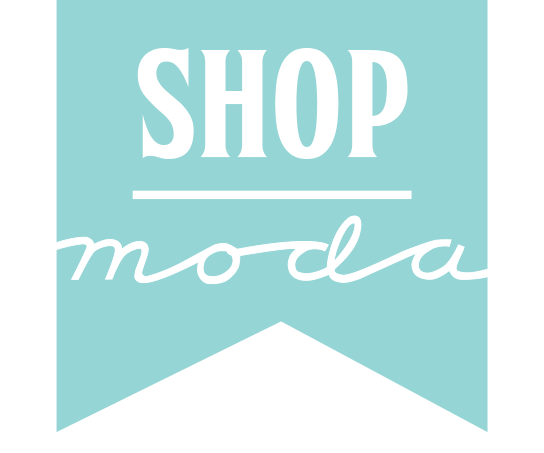 Two strips of Blue Polka dot fabric cut @ 2 1/2″ x 42″ for pillow binding. 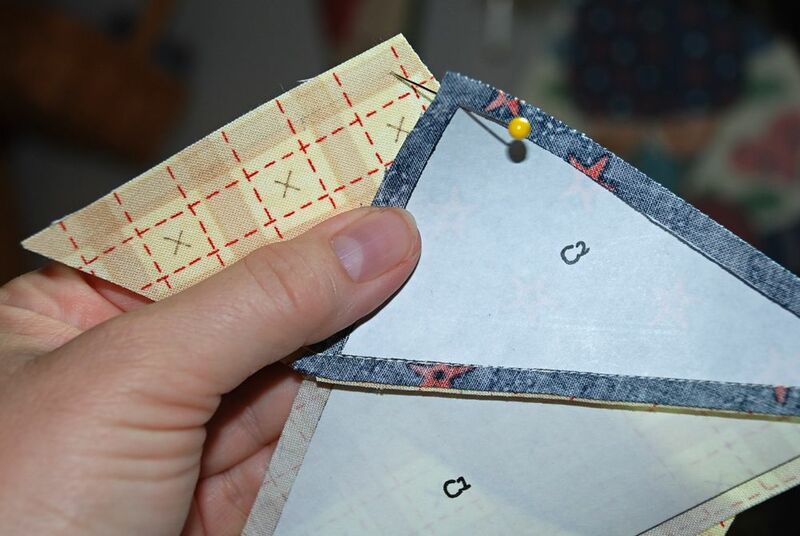 Make a quilt sandwich with the top, batting, and muslin then pin and quilt as desired. Square up your pillow to 14 1/2″ x 14 1/2″. Now take the two Red floral fabric pieces and fold in half, press. 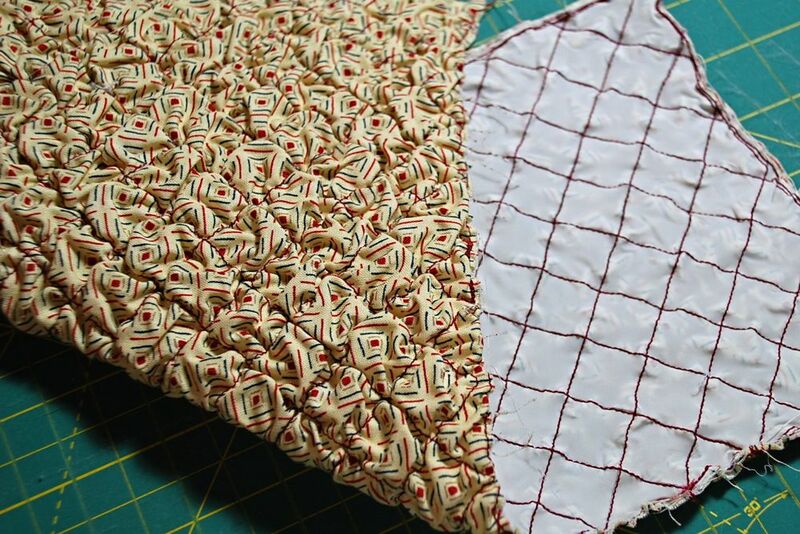 Now take the two pressed flaps with the folded edges facing toward the center of the pillow and the raw edges lined up with the edges of the quilted pillow top. Sew a narrow seam all around the pillow making sure to reinforce the centers where the fabric flaps overlap. 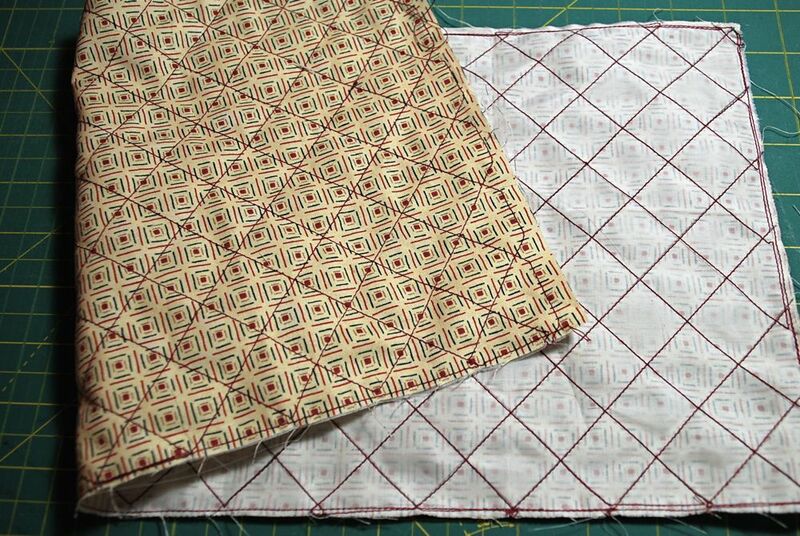 This is the opening where you will insert the pillow and you can also take out the pillow anytime to use as a small table quilt or wall hanging. 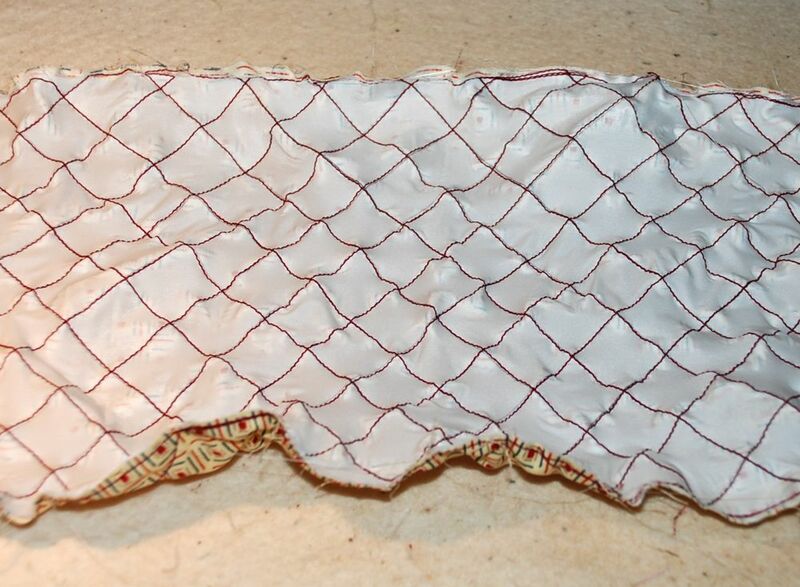 This picture shows the back opening of the original pillow (as seen below). 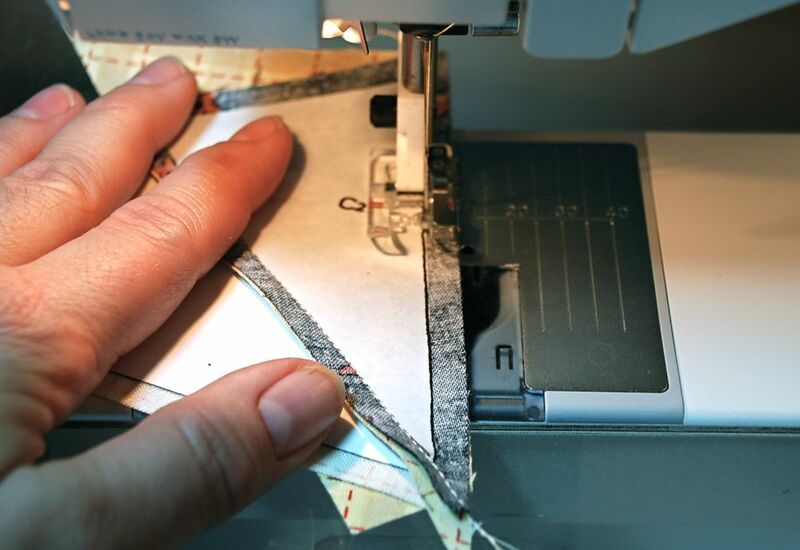 Sew the two binding strips together and then sew on the binding using a 3/8″ seam. Turn the binding to the back and hand sew the binding to finish it off. You may add buttons to embellish your pillow. Add the pillow insert and you’re done. I hope you enjoyed this project. 1 Pillow and enough leftovers to make another project. 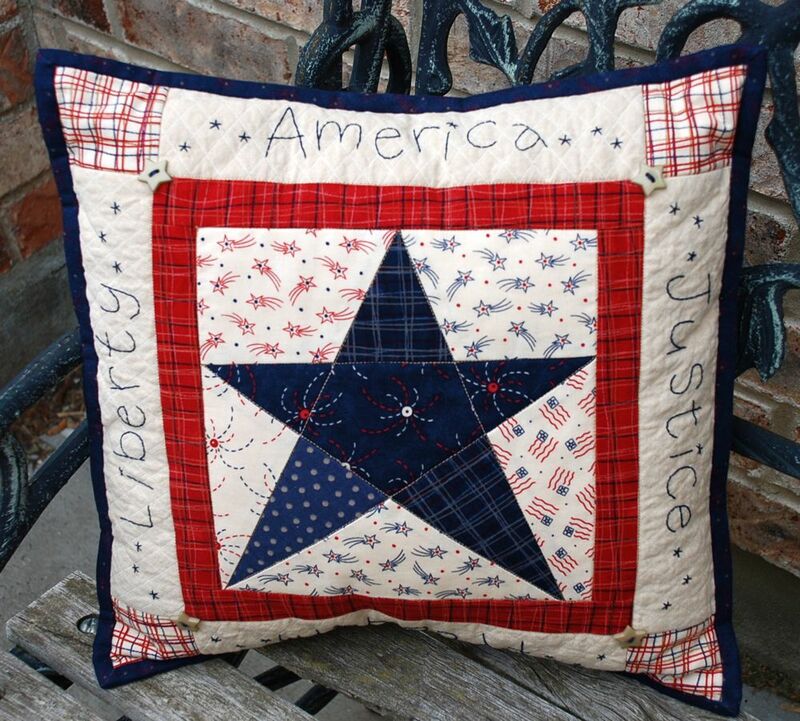 This is an earlier version of my Patriotic Star Pillow. I hope all of you have a wonderful Independence Day with your friends and family!